The freestanding DFN04C10W has 12 place settings and is designed to fit the whole family’s plates, bowls and utensils with ease. Adjustable basket features, such as folding plate/cup racks and a sliding cutlery basket make it easier for you to fill the machine. 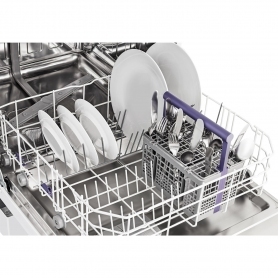 There should be no trouble clearing the dinner table with this dishwasher on hand. With four programmes and four temperatures to choose from on the DFN04C10W, you can tailor the wash to each load. There’s the standard ‘Clean and Shine’ setting, as well as an ‘Intensive’ setting to wash away tougher food and marks. The ‘Eco’ option washes a regular load with less water, while the ‘Mini 30’ mode washes for 30 minutes at 35°C – this mode is perfect for lightly soiled plates and cups when you’re in a hurry. All of these modes can be selected easily on the dial display. The Half Load mode is great for when you need certain things cleaned, but don’t have enough for a full load. 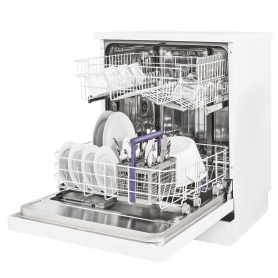 This Beko dishwasher will adjust the amount of water it uses in this mode, reducing waste and saving money. Wondering how much longer until your load finishes cleaning? 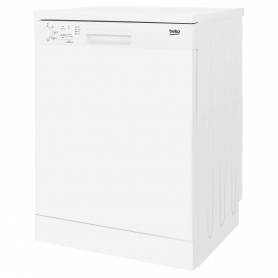 The Beko DFN04C10W also features programme progress indicator lights, as well as salt and rinse aid indicators, so you won’t have to guess what’s going on inside your machine. 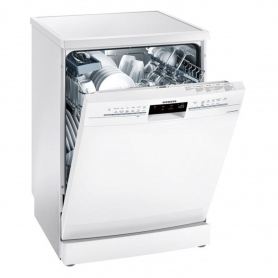 Beko has designed this dishwasher to work around your needs. It has folding cup racks on the upper basket, and folding plate holders on the lower basket, so you can change the space to suit your load. With a height adjustable upper basket, you’ll have even more flexibility. The DFN04C10W also uses a concealed heating element to hot air dry your dishes once the cycle is complete. Awarded an A+ energy rating, this efficient machine could cost you less to run than your current dishwasher. 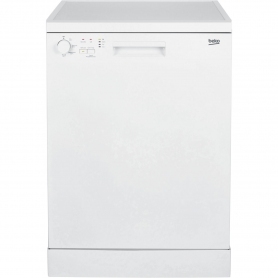 As a result, the Beko DFN04C10W is kinder to the environment and your bank account. 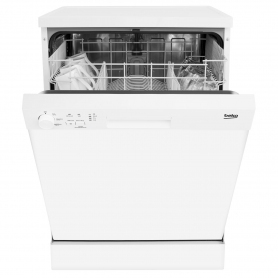 This dishwasher also comes in white and is sure to suit any kitchen. It’s exclusive to Euronics and agent stores, so you won’t find this fantastic appliance anywhere else. 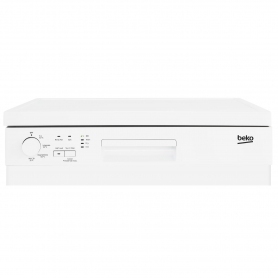 Discover an easier, more efficient way to wash the dishes with the Beko DFN04C10W. Order yours today.